Every one should lead their life so that no pain is caused by them to any living being. That is the supreme duty. Also, it is the duty of everyone who has had the chance of this human birth to spare a part of his/her energies occasionally for prayer, repetition of the Lord’s Name. One must devote oneself to a life of truth, righteousness, peace and good works which are of service to others. One must be afraid of doing acts that are harmful to others or deeds that are sinful, just as one is afraid to touch fire or disturb a cobra. One must have as much attachment and steadfastness in carrying out good works, in making others happy and in worshipping the Lord, as one now has in accumulating gold and riches. This is the Dharma (Right Action) of every being. Everyone in the world desires victory. No one desires defeat. All crave for wealth, no one craves for poverty. But, how should one achieve victory and wealth? There is no need to undergo threefold struggle – physical, mental, intellectual – to achieve victory. Nor one need get perturbed or anxious or pine for wealth and prosperity. Take refuge in the Lord. Wield the bow of courage by holding your heart pure. That is enough. Victory and wealth will be yours. As you pursue victory and wealth, remind yourself that they are like your shadows, not substantial things in themselves. You cannot attain your shadow, even if you pursue it for a million years. One has to be careful in matters relating to realization of God. Whatever inconveniences one may encounter, one must try to carry on one’s Sadhana (spiritual practice) without any break or modification in the discipline. One name that does not give any slightest feeling of dislike or disaffection should be selected for meditation and japa (repetition). One should not change the Name and the Form that one has loved and cherished and selected for repetition. Concentration is impossible if the Name is changed; the mind will not attain one-pointedness. Each one of us is in the very same situation. Any little accomplishment, any little deed is always supported by the unseen hand of our Beloved Lord. When I look back into the face of time, I find a rainbow of memories flashing before me. There is one thing I never failed throughout. 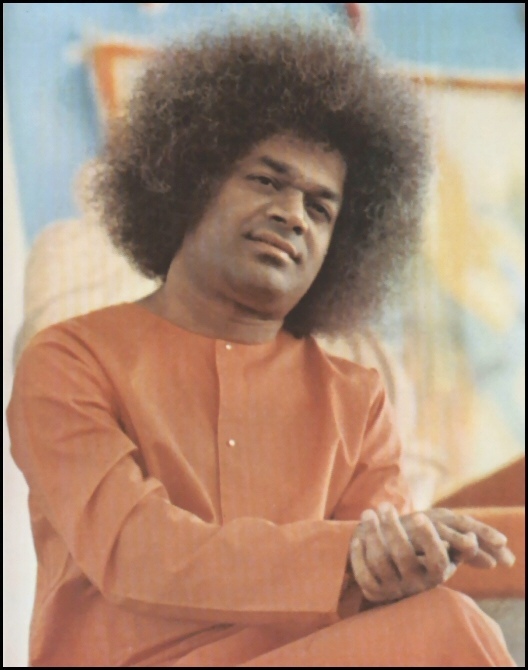 It is the presence of Bhagavan Sri Sathya Sai Baba, saturated by His Love. Every moment is filled with His omnipresence, omnipotence and omniscience. However it is for us to recognize this truth A couple of years ago, my parents along with my brother and I were taking a walk down the shopping lanes of London where we intended to make our purchases. On our way out one of the supermarkets, my father accidentally happened to put his hand into his hand baggage and to our dismay he found all our passports missing! 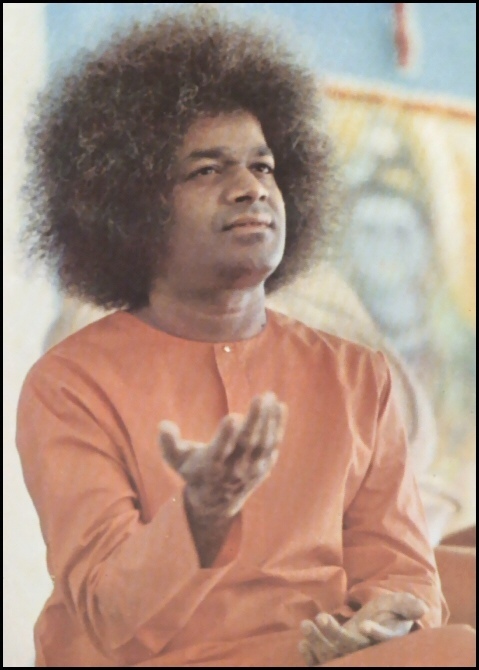 We were initially panic stricken, but our faith in Bhagavan Sri Sathya Sai Baba removed all our fears. We searched all around the place, retracting our steps but there was no sign of any of our passports. My father went down the lane making inquiries, but none of them brought us anywhere close to our passports. My father finally decided to register the problem with the police and started looking out for police officer. As he proceeded, a young Englishman whom he saw for the first time came straight to him and said. “You must be looking for the lost and found department. Sir it is right over there,” and gave him some landmark. My father walked into the office of the British cops, as he had been directed to. As he opened the door of the lost and found department, he saw the officer in-charge just placing all our passports in a bag. “Thank God”, his exclamation was enough to inform the officer that those passports belong to us. My father said that there wasn’t any one he met. But the officer was not satisfied. He went on and said that the man who gave the passports just left a few seconds before my father came in and he said that he was the owner of the shop. My father just posed one last question on his way out with passports. “How did he look like?” The reply to the question was enough to throw us back in our seats and start thinking. 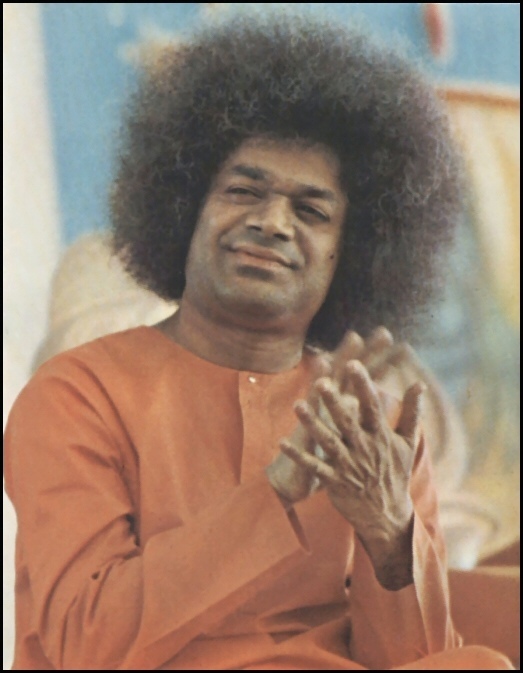 Every single description matched the splendor of our Beloved Bhagavan Sri Sathya Sai Baba and we were deeply thankful for all that he had done for our family. 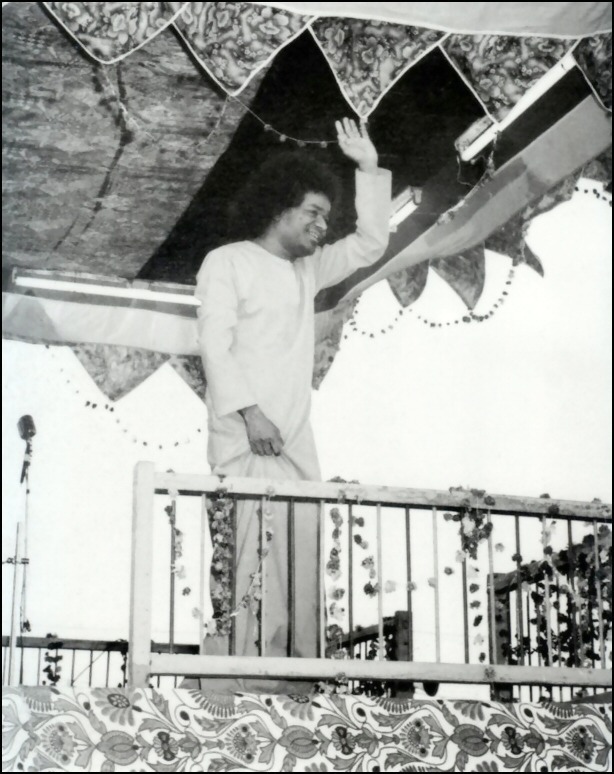 It was about nine months after that Bhagavan Sri Sathya Sai Baba appear in the dream of my father and confirmed His presence at London in a very unique way. The amount of concern Bhagavan has for each of us in much more than what the word concern literally means. The unfathomable ocean of His love goes far beyond our mind’s comprehension. There is a lot we students to learn from His actions, from His words and a lot to learn from His love. 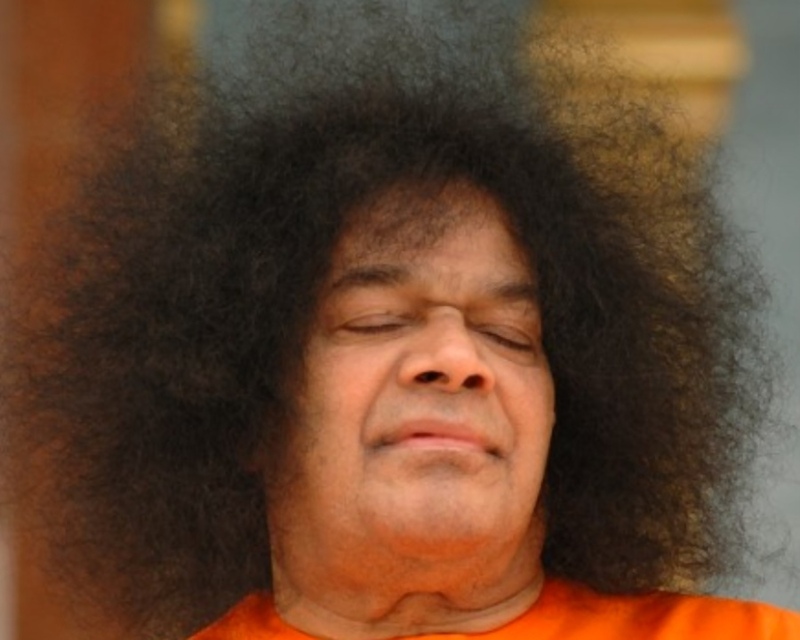 We have to travel far beyond to be able to know actually how fortunate each of us is to be with Sathya Sai Baba. What we see of Him today is a very minute spectacle of what He actually is. Each one of us is on a long journey, “from us to ourselves” and we are immensely fortunate to have our goal. Bhagavan Sri Sathya Sai Baba as our guide. And on this journey, it is my constant prayer to Bhagavan that He be with us and guide us throughout so that I may be an instrument in His hands. If the art was mother’s gift, the title Bala Meera was given by Jawaharlal Nehru. On a hot Sunday afternoon, Meera Grimes aka ‘Bala Meera’ Chandra receives you at the entrance of her spacious apartment on Poonamallee High Road, with a broad smile. For a moment, I remember those days when my family members would hurriedly complete the evening chores and rush to concerts and katha kalakshepams. One was child artist Bala Meera Chandra’s harikatha. I recall the discussions that would go on till late at night about her treatise on the subject that day, her charming looks, her abhinaya and her fantastic voice. Bala Meera’s brothers were her accompanists and her cousins and aunts gave her vocal support. Her mother never missed her programmes. “Having heard about you, I wanted to see how a little girl in a skirt performs this art. That’s why I am here a day earlier. I am really proud of you and will help you hone your skills further,” was harikatha exponent Embar Vijayaraghavachariar’s comment when Bala Meera fell at his feet after her performance at Bangalore Ramani Ammal’s festival. Embar was to perform the next day. She reveres Embar a lot and values whatever she learnt from him. She rates her harikatha performance on the 30 saints in 30 days at Sai Samaj, Mylapore, as one of her best. ‘Krishna Rathna Thrayam’ taught to her by Swami Remaji was another pet subject. Performing alongside the women trinity M.S., MLV and DKP at a Tiruttani festival got her an opportunity to perform at The Music Academy, on the request of T.L. Venkatrama Iyer. Dr. V. Raghavan helped her get a scholarship from the Academy to learn Lalithopakyanam under the tutelage of Mahadeva Bhagavatar. In the process, she learnt many Dikshitar kritis. “As I was busy with my concerts, harikatha and dance programmes, I did B.A. privately. After obtaining a Diploma in music and dance, I went on to do my Masters at the University of Madras. That’s where I met John Grimes of the U.S., who was doing research. He was deeply into Indian philosophy and wanted to marry an Indian who would help him in his journey. That’s how we got married, with the blessings of the elders and Sri Sathya Sai Baba of whom he was an ardent devotee.” The bookshelf in their house is full of John’s books on Indian philosophy, including a treatise on Adi Sankara’s Viveka Choodamani. Her book ‘Harikatha’, that covers Samartha Ramadas’ contribution to art of spiritual story telling, is what she considers her best contribution to this art. She says Samartha Ramadas is the father of harikatha for it was he who codified it logically into a structure. The spiritual guru of Chatrapathi Shivaji, he travelled to South India and established maths in Thanjavur when it was ruled by Shivaji’s step brother Ekoji. That’s how harikatha spread in the South. Bala Meera also hails Thanjavur Krishna Bhagavathar, who was a violin vidwan for harikatha performances then, as the father of harikatha kalakshepam, for he adopted it to suit this part of the country. “Nonetheless, Samartha Ramadas’ ‘Dasa Bhodha’ is the ultimate book on harikatha and its grammar,” she says assertively. As I take leave, “Harikatha is a sugar coated pill,” she sums up. A large number of students and staff turned out for the University of the South Pacific’s blood drive at the Laucala Campus in Suva. Organisers said they were surprised at the “strong” attendance. Sister Salaseini Boletawa of the USP medical centre said about 60 people turned up during the first four hours. “The response from the university staff and students has been great and we expect about 20 to 30 more people to donate blood in the remaining hour,” she said. The blood drive was held from midday till 5pm yesterday at the medical centre. The medical centre also took advantage of the blood drive, and used video documentaries to educate donors on communicable, non-communicable and sexually transmitted diseases, and the preventative measures that could be taken. The drive was joint effort between USP, the Fiji National Blood Service and the USP youth wing of Sathya Sai Service Organisation of Fiji. Chief Minister B S Yeddyurappa on Sunday launched an exclusive website — karunadu.gov.in/floodrelief2009/, which gives a detailed information about the recent flood fury. Meanwhile, donations for flood victims kept pouring in. As a contribution towards relief of flood victims, Sri Panduranga Vishnu Sahasranama Mandali, has transported and distributed 20,000 chapatis and bun packets. The President of the International Federation of Karnataka Christian Associations (IFKCA), Bangalore, Ronald Colaco has donated a sum of Rs 10 lakh towards the CM’s relief fund. Karnataka Medical Council has contributed Rs 1 lakh towards Chief Minister’s relief fund to help rehabilitate flood affected victims. Basavanagudi Srinivasa BJP Mahila Morcha collected Rs 21,600 and donated it towards CM’s flood relief fund. Karnataka State Tailor’s association contributed Rs. 1 lakh towards CM’ relief fund. Sri Sathya Sai Seva Organisations (founded by Bhagavan Sri Sathya Sai Baba), Karnataka have sent 5 truck loads of relief materials. Federation of Karnataka Electricity Board Employee’s Union and Associations and all Escoms has contributed one-day’s salary and Rs 3 crore towards Chief Minister’s relief fund. Karnataka Soaps and Detergents Limited have contributed Rs 50 lakh towards CM’s relief fund.